New technology means we are doing many things differently, including planning our travels. We do more and more of our travel research and bookings on-line. 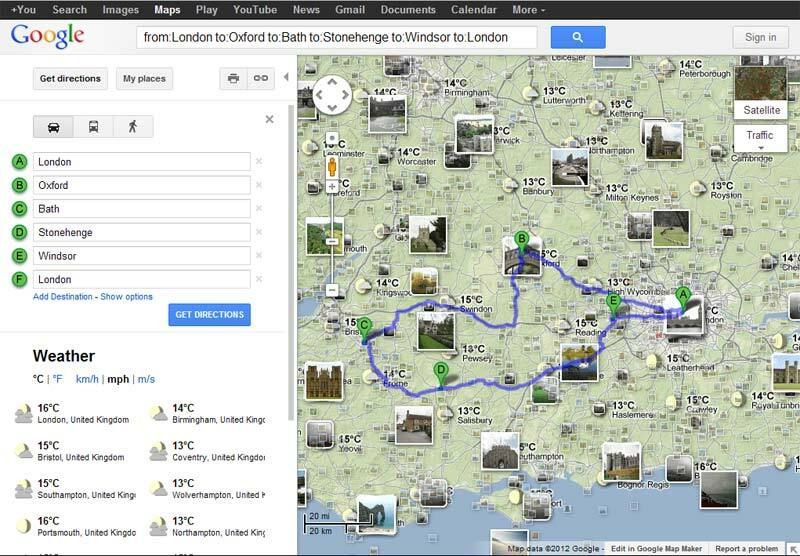 Google Maps is not a travel-planning tool as such but it can still be very useful in helping you planning your trip. It is free and easy to use and in this article we explore how you can best use it for your trip planning. 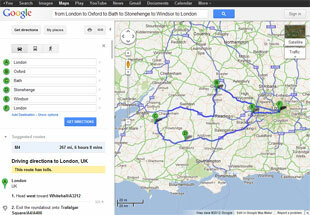 Google Directions is great for calculating directions and planning “road travel”. 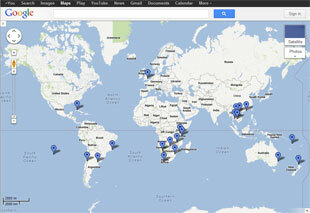 Just go into www.google.com and choose Maps from the black menu at the top. Then key in your starting and final destination and Google Direction will suggest a route, calculate the length (miles / kilometers) and estimate the time it will take you to drive this route. You can add more destinations as you like. For example, the following route: London -> Oxford -> Bath -> Stonehenge -> Windsor -> London, is 267 miles (430 km) and estimated to take 6 hours and 8 minutes to drive. You can easily adjust the route, say if you want to avoid highways or toll roads. You can also adjust the route manually by moving the blue line with your mouse. You can view your route as a standard map, satellite, or as an earth view (though you need a simple plugin in your browser for that feature). Sometimes you can even view your route in 3D. In addition to these different ways to view your route, you can add various extra information's to your personalized Google Maps, such as photos, weather information, traffic, terrain, location of webcams (speed cameras), videos, Wikipedia, etc. I have added weather and photos my map on the right, which is the same map as the one above. 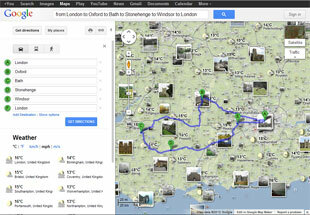 Google Directions is great when planning a car journeys; we use it all the time. Google My Places allows you to create and share personalized annotated Google Maps with selective group of people... or the whole world. This is really fantastic feature. To use this feature you need to sign into your Google account. Then start with Create a Map and give it a name and description. You can also chose if you want your Google Maps to be public (shared with everyone and published in search results) or unlisted (shared with selected people only, i.e. those you give the map's URL). You can allow people to collaborate to your map and even to edit the map if you want to. This can be useful when planning a trip with other people. You can also import map data from a KML, KMZ, or GeoRSS file to your map. Find your starting place on the map. You can use the mouse to zoom in or out or use the search function. Click on the “blue balloon” to mark a spot, you can write the name and description next to it. Continue marking the spots you want to mark. You can then draw lines between them if you want. You can use many of the options as in Google Directions, e.g. view it as map, satellite, or earth and add various extra information's, like photos, traffic, weather, etc. This is very useful when planning a trip, not least if you are planning the trip with others. Being able to visualize the journey always helps. Your personalized Google Maps is also a great souvenir or way of representing your travel plans, like this around world tour map, which shows our around the world adventure. If you like to know more about our world tour, check our Travel Stories. Google Maps is not a travel planning tools as such, but you can easily use it to help you plan your trip and share it with your family and friends. It is free and user friendly and has some beneficial additional features and information's, like photos and weather. Moreover, it is still developing so new features are being added on regular basis. If you want to do more sophisticated travel planning, then you might want to consider some of the specialized on-line travel planning tools available. TripIt offers one of the most comprehensive free travel-planning tools but if you travel frequently, you might want to upgrade to TripIt Pro.